This week started out with our hottest day of the year & everyone wishing for a cool down. What�? ?s the old saying �? ?Watch What You Ask For�?�. Well they got it as we had two cold fronts bringing heavy cold rain. The fishing usually does not fair well in those conditions but our guests toughed it out catching some nice fish. Father / Son Brian & William Reames from Nashville, TN returned for their 3rd trip with Brian�? ?s good friend David Murphy & son Thomas from Richmond, VA for their 1st visit. 1st day was a very good day as this group caught Smallmouth Bass and a few Northern Pike with both Brian & Thomas coming up big, each landing a Trophy Smallmouth Bass. 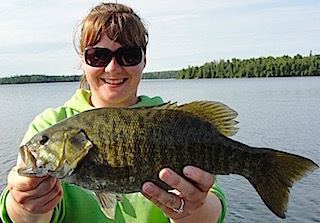 2nd day they faced a severe cold front with strong winds but did better than expected catching Smallmouth Bass & Pike. Just Brian & William alone landed 21 Smallies & 3 Northern Pike. 3rd & final day was FANTASTIC catching 66 fish, most Northern Pike, along with several Smallmouth Bass. All left have a great time making many father & son memories. Life long friends Larry Hinshaw & Pat Hobson from Blue Grass, IA & Elwood, IN returned for their 8th year. 1st day they caught plenty of Smallmouth Bass with a mix of sizes including several 17.5�?�ers and Pat caught a HUGE 19.5�?� Trophy. 2nd day was spent battling high winds with cold front conditions. They managed to catch a dozen Samllmouth but it was with a lot of Rock�? ?n & Roll�??n. 3rd day they thought of using the drop shot technique to gain more line control on a 2nd windy day & it worked well for them catching about 20 Smallmouth Bass. 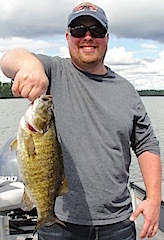 4th day was super as they caught a lot of BIG Smallmouth Bass & lost count after 30. 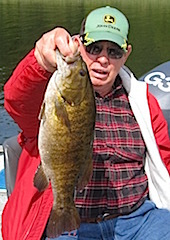 Larry caught 1 Trophy Smallmouth at 18.5�?� but Pat landed 5 Trophy Smallmouth a 20�?�, 2 at 19.5�?� & 2 measuring 18.5�?�. 5th day they faced a severe cold front, high winds, & heavy rain, which brought these two avid anglers in by noon waving the white flag. 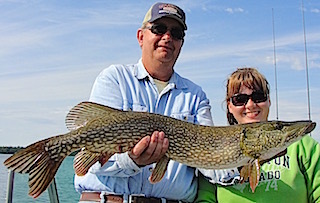 6th day despite the cold front conditions they managed 21 Smallmouth Bass & a few Pike. 7th day was tougher getting the bass to bite catching 10. Last day Pat did great & according to Larry after he showed Pat how it was done. Both enjoyed their trip making more fishing memories together. Returning for their 9th consecutive year were Audrey, Don & Matt Holesinger from Fulton & Roscoe, IL DOA Smallmouth were the main objective and while catching some Matt was surprise when a large 37�?� Muskie ate his sinking worm. The fight was on & Matt succeeded in landing this beast with a light rod, & 8lb test. 1st day was a tough cold front day with heavy winds doing well catching Smallmouth Bass & a few Pike despite the conditions. 2nd day they caught 21, with a lot being Big, Audrey caught an 18.5�?� Trophy & Matt had 2 measuring 18.5 & 19.5�?�. 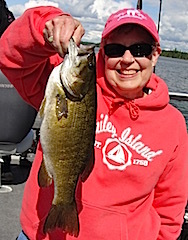 3rd day was absolutely super as they caught 63 fish, 49 Pike & 14 Smallmouth Bass with Don landing 2 Trophy size at 18 & 19�?�, but Audrey had the catch of the day with her 19.5�?� Trophy Smallmouth Bass. 4th & final day they were met with a severe cold front, high winds with heavy rain. 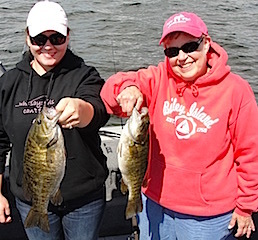 Most were in by noon, but these 3 fished until 3PM catching 21 Smallmouth Bass & 2 Pike. All departed having great family vacation making many wonderful memories. caught some SB & Pike & Dan caught another Trophy 18�?� SB. 6th day was great as they got right into the Smallmouth Bass again catching 16-17.5�?� fish, Monica landed a Trophy 18�?�, & Crystal caught a big 36�?� Northern Pike. This was Crystal & Brian�? ?s last day & left having a great 1st experience. 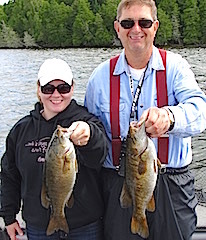 7th & 8th days John & Monica missed having Dan & Crystal in the boat with them as the continued having good fishing catching Smallmouth up to 17.5�?�. The left with some tears of happiness for the wonderful memories made, & tears of sadness that it was over. Keeghan landed a beauty 18.5�?� Master Anglers Award Trophy. 2nd day found them back at the dock before noon as a severe cold front (high of 54) heavy rain with high winds made it very difficult to fish so both had a long nap before supper. 3rd day they caught numbers of Pike during the day & in the evening caught some bigger fish with Keeghan having a big 34�?� Northern Pike hit his popping frog ending the trip on a high note. Both made great memories & before departing Walt reserved their dates for 2016. Cousins Frank & Doug Kerr from Plainfield, IN & Henrico, NC returned for their 5th consecutive year. 1st day was a terrific start to their trip catching 56 Smallmouth Bass including several trophies over 18�?�. 2nd day was a cold wash out having heavy rain, cold temps & high winds. 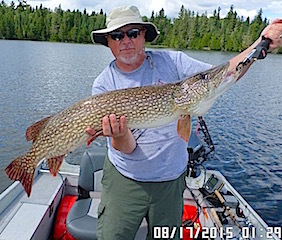 3rd day was slow because of the sever cold front but they managed to catch 9 SB and a few Pike. 4th day they caught fish but the bass still seemed off from the front. 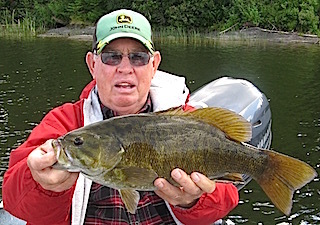 5th day things started to recover & they finished strong catching 25 nice size Smallmouth including Doug landing a Master Anglers Award Trophy Smallmouth Bass measuring 19�?�. Before departure they were already discussing possible dates for 2016. Here for their first visit was Dave & Doug Byrum, Muncie, IN. 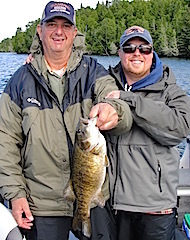 & Brighton, MI with Dan Phelps Somerset, KY . DOA & 1st full day they were met with tough cold front conditions with heavy rain & high winds & for 1st timers did well catching a mix of Smallmouth Bass & Northern Pike, plus had a ball having conversation & laughs. 2nd day they had a great day catching Pike & Smallmouth Bass with a good number of them being over 16�?�. 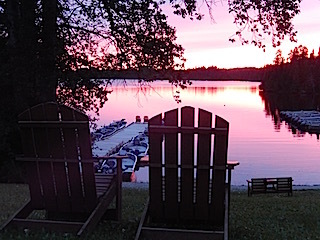 3rd & final day they had a great day catching many Northern Pike and Smallmouth Bass ending on a strong note. Dave said they all had a thoroughly enjoyable trip fishing & enjoying each other�? ?s company, plus the bonus of meeting other guests during their stay. 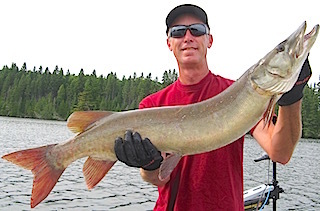 Catches of The Week: 42 Northern Pike, 37�?� Clear Muskie, 27 Master Anglers Award Trophy Smallmouth Bass 2 at 20�?�, 5 at 19.5�?�, 4 at 19�?� the rest measuring 18-18.75�?�.